Another phase in the restoration of Notre Dame Gate, in Vittoriosa, by Fondazzjoni Wirt Artna. 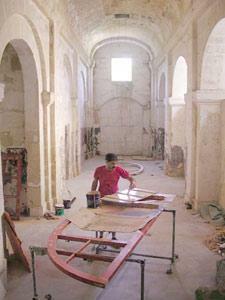 The timber apertures at Notre Dame Gate, in Vittoriosa, are being restored by Fondazzjoni Wirt Artna. This has been possible through a long-term sponsorship agreement with The Alfred Mizzi Foundation, FWA said. About 40 traditional timber windows, shutters and doors are being revamped. The apertures have wrought iron fittings. The majority date back to late 19th and early 20th century, but five at least date back to the late 18th century. Notre Dame Gate is one of the original seven gates built along the Cottonera Lines by Grand Master Fra Nicola Cotoner in 1670. It was meant to serve as the principal gate for the south-eastern towns and villages. The gate was named after Our Lady of Graces, the patron saint of Zabbar. It is also known as Cotoner Gate, Zabbar Gate and Bieb is-Sultan. Notre Dame Gate, the highest building in Cottonera, is built on five levels with an elevated gatehouse resting on two massive arcaded flanks each of which were designed to offer bomb proof cover to anyone taking refuge in them during a bombardment. Above its central section stands a stone niche flanked by stone putti and surrounded by trophies of war in which rests the bronze effigy of Grand Master Cotoner. After long years of neglect and misuse, Notre Dame Gate was passed on to FWA by the government for restoration and management. Mario Farrugia, FWA chairman and CEO, said that on completion of the restoration works, the gate will be opened as a visitor attraction focusing on the rich history of the Cottonera. "A visitor view platform is envisaged on the roof of the same building from where breathtaking vistas of most of the island, including the south-eastern coast, Mdina, Grand Harbour and Valletta can be enjoyed," Mr Farrugia said.